All pet owners will tell you that owning a furry friend brings a host of joys, but having a clean house is not usually on this list! Stains and odors are a natural by-product of owning a pet, but this doesn’t mean that you should settle for living in an unclean environment. There are plenty of commercial cleaners which are readily available to help with the issue. But with a lot of choice comes a lot of confusion. You need to know what products are available, as well as the key features that you should be looking out for. Luckily for you, we are here to help with our comprehensive product selection of the best pet stain removers. So, let’s get your home back to its sparkling best! Whatever stain your pet has left behind, this professional strength stain and odor eliminator promises to tackle the problem. One of the main strengths of this product is that it gets deep down into the stain with natural enzymatic bacteria. So, if your dog has peed on the rug, you should feel comfortable using this chlorine-free and color-safe solution. You can use this pet stain remover on a wide range of surfaces including carpet, hardwood floors, furniture, and litter boxes. And you can rest assured that it is safe to use around your pets and children. One of the biggest issues about your pet leaving a mess is the odor which lingers around afterwards. This super strength odor-eliminator has been used in some extreme environments such as rendering plants and poultry farms, so it is certainly good enough for your home as well! The cold press custom formula is derived from the oil found in orange peels, so it is both biodegradable and non-toxic. It can be used anywhere that pet waste becomes an issue, whether this is inside or out. All you need is to use a small amount and it will go a long way! Using a powerful natural enzyme formula, this carpet stain remover tackles urine, faeces, vomit, and drool. It can also be used on other surfaces such as hardwood, leather, and rugs, and you can rest assured that it is not harmful to your pets or children. This product is made in the USA, and the company also donates 10% of all profits to animals in need. Ultimately, it makes cleaning up after your pets simple, so you don’t have to dread this job quite so much. 30 seconds is all it takes for permanent stain removal using this carpet and area rug stain remover. Just some of the common stains which you can remove using it include pet waste, tracked-in dirt, and blood. Not only does it remove difficult pet odors, but it also discourages your furry friend from resoiling the same area. If there are old stains or those which won’t seem to shift, you can heavily saturate the area for an improved performance. When used as directed, it is safe to spray around kids and pets alike. Promising to permanently destroy pet stains and odors, the dormant bacteria contained within activates after hitting the stain. It boasts that it is more effective than other enzyme sprays, and there is even a money-back guarantee if you are not fully satisfied. And it is the kind of cleaner that you can use in a wide range of areas around the home including the kitchen, living room, bathrooms, and others. 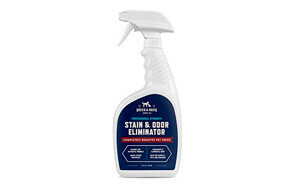 As soon as you spray this stain and odor remover for dogs, it will immediately start to break down and remove stains. As long as any bio-based mess is still present, it will continue working. The light citrus scent leaves your home smelling clean and fresh all over again. This ready-to-use spray tackles a host of bio-based messes including urine, faeces, vomit, and drool on a host of surfaces including carpet, tile, hardwood, and linoleum. Make stubborn grease, dirt, and grime history with this instant carpet spot remover. As well as pet accidents, you can also use it to deal with a host of other common stains such as grease, ink, blood, and red wine. Not only is this solution safe for color-fast carpets and upholstery, but it also works well on woodwork and wall surfaces. It gets to work on its own and no rinsing or vacuuming is required afterwards. Tackling the toughest of pet stains and eliminating unpleasant pet odors, this remover is specifically designed to be used on carpets. It is also formulated to work in Bissell and Dirt Devil compact deep cleaning machines. Since it contains twice the amount of concentrated product, you don’t need to use so much of it to get a high level of cleaning power. You can also use it on rugs and in car interiors. On soft surfaces, this pet stain remover promises to deal with 99.9% of bacteria. These are the kind of surfaces that you and your family come into contact with every day, so you need to clean them effectively. The penetrating action of the formula has been specifically created to deal with odors, stains, dirt, and common allergens. As well as using it on your carpets, you can also use this product to tackle stains on your upholstery, stairs, bathroom mats, and area rugs. We all know that pet stains can be tough and long-lasting, but this professional strength formula has been specifically created to deal with the worst stains and odors. The Pro-Bacteria and enzyme formula has been formulated to work on the type of organic stains which your pets leave behind such as urine, faeces, and vomit on your carpets. When you are applying this USA-manufactured stain and odor remover, you have a choice of whether to use a foam, mist or steam, thanks to the 3-in-1 nozzle sprayer. The severe mess formula of one of the best pet stain and odor removers is designed to deal with the stains that your dog leaves behind. The ready-to-spray bottle can be used whenever you need it. As long as there is any bio-based mess still present, this formula will continue working. As well as removing the odor of the stain, it will leave behind a light fresh scent to keep your home smelling great. It takes just 15 minutes to do most of the work, but you should allow the area to dry for up to 24 hours to enjoy the best results. 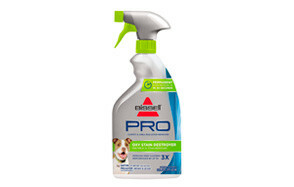 Permanently remove pet stains and prevent your pets from going there again with this professional strength concentrate. Other tough stains which this formula can tackle include food, drinks, and blood. Since it is an all-purpose cleaner, you can feel comfortable using it on kitchen counters, bathroom fixtures, cars, and other problematic stains around your home and garage. Not only is it effective, but it is also safe for your household and you will not leave behind any dangerous chemicals, so you can clean your kitchen without worries! This carpet stain remover is designed to eliminate the toughest of stains – even those which have been hanging around in the area for a long time. 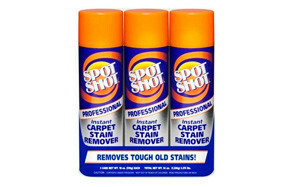 All you need to do is spray in on and start blotting the stain away. There is no need to go through the effort of rubbing or scrubbing! You can rest assured that the formula is non-toxic and safe to use around your pets. It is also biodegradable, so will not leave streak marks and stains behind. Now that you know a little bit more about some of the top products on the market, it is time to look at some of the specific factors that will influence your decision. Just as you should always check the ingredients of your food, you should also look what is going into your cleaning products. Check for all-natural ingredients as these are generally both safe and effective. Bioactive enzyme formulas are common, and they play a big part in speeding up the degradation of molecular bonds and attack organic matter. Other products come with citrus ingredients, which are specifically designed to neutralize odors and leave more pleasant smells behind. There are several different types of cleaner on the market, and we will discuss each of them in more detail later in the blog post. For now, you should simply remember that the type of cleaner you choose should play a role in your decision-making process. Safety is paramount when you are using a cleaning product around your home, so check the cleaner’s credentials with regards to both human and pet health. As a secondary concern, you should also check how it is going to affect that surface that you spray it on. Harsher chemicals may damage fabric materials when sprayed onto them. If you want to be safe, it makes sense that you opt for a recognised brand which has undergone rigorous testing. You could also look closer at the country of manufacture. Remember that enzyme cleaners are a popular choice as they are often non-toxic and safe to use around your home. Not only this, but they are also effective at removing a host of organic stains. The surfaces which you are planning on cleaning should certainly have an impact on the product that you select. Generally, these can be separated out into hard and soft surfaces. For example, the products which are specifically designed for carpets may not be nearly as effective when used on hardwood floors. Worse still, they may be damaging to these surfaces. Some pet stain and odor removers can be used on a wide range of surfaces, so choose one of these if you plan on cleaning the whole house. Cleaning up pet mess is obviously an unpleasant job, but if you choose a product which is easy to apply, this helps to make your life just a little bit easier. Many come in a spray bottle of some variety, so you can easily apply them onto the stains which occur on a wide range of surfaces. Some spray nozzles are designed to give you different application options depending on the stain which you have to deal with. Others may require dissolving, and some are only suitable to be used in spot cleaning machines. But you also need to factor in effectiveness alongside ease of application. There is no point in buying something which is easy to apply but doesn’t work. Different products have varying degrees of concentration, and there is no single right answer to how concentrated you need the product. Sometimes, you need a concentrated product when you are adding it to your carpet cleaner. Other times, you may need a spray that you can apply straight onto the carpet. As they are useful in different situations, you may decide that your best course of action is to buy one of each and cover all your bases. Remember that concentrated products are more potent than their unconcentrated counterparts. Therefore, they have a greater risk of causing allergic reactions if they contact your skin, so you need to be especially careful when using them. There are plenty of scented pet stain removers out there which are highly efficient. However, you need to be wary of the ones which mask stubborn odors rather than getting rid of them completely. Check the customer reviews to get a better idea of what you are buying beforehand. Generally, the scents are citrus-based, which should leave your home smelling nice. If you do choose one of the odor-free sprays, you should bear in mind that many will emit a slight scent when they are first sprayed so that you know it has been sprayed. This should disappear after a short period of time. There is a wide range of different reasons why a carpet stain remover could prove to be a useful addition to your cleaning arsenal. Here are just a few of the most common factors which could encourage you to invest in one yourself. While air fresheners only cover up the smell which is already there, odor neutralizers get to work on the harmful molecules themselves. The enzyme solutions which are present in many of these products break down the bonds of odors. And many carpet stain removers are scented anyway, so they will leave your home smelling great, as well as eliminating any lingering odors. Germs and parasites are found in pet waste, and you certainly want to clear these out of your home as soon as possible. Many come with essential oils or plant extracts with well-known antimicrobial properties. Others come with claims to kill as much as 99.9% of bacteria. You will feel a lot more comfortable in your home knowing that your floors and surfaces have been thoroughly sanitized. As well as cleaning your surfaces, many of the stain and odor removers which we have discussed above help to stop your pet from going to the bathroom in the same spot. And this can be used as part of a training regime stop your pet going indoors or encouraging them to go in the right place. 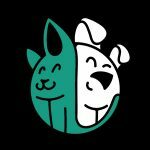 You can also buy separate products which are specifically designed to deal with the task of stopping your pet going to the bathroom in a certain spot. Many people suffer from pet allergies and using a carpet cleaner can be an effective way of removing these allergens from your home. Of course, this isn’t the main reason why you use them, but it can prove to be an added bonus. The premium products on the market don’t contain the kind of harsh chemicals or bleaches which will damage your delicate fabrics and surfaces. Again, it is always worth checking that the product which you choose is suitable for the surface which you plan on using it on. As we have already mentioned, enzyme cleaners are a highly popular choice these days. If you choose enzyme cleaners, these products are non-toxic and safer than many chemically-based cleaners. After the soiling agent has been broken down and consumed, the bacteria will die off. This is why many of these cleaning brands recommend vacuuming the surface after it has dried. Safety and effectiveness are two of the main reasons why they have become so popular over recent years. Now, we are going to look in a greater level of detail at the different types of cleaners which are readily available, so you can make a more informed choice. The most common type of cleaner which we have discussed in this blog post is the spray. Most of these contain natural enzymatic bacteria which are activated on contact with odors and stains and are specifically designed to eliminate both. Generally, they are safe to use around pets and children, and they often work on a wide range of surfaces – though you should always check the bottle to make sure of this fact. One of their main advantages is that they are nice and easy to apply. Next, you have the various concentrated formulas readily available. Since these are strong, it means that a little goes a long way. However, the application process may not be quite as straightforward as the sprays. You should also wear gloves when you are using them to prevent allergic reactions from occurring. Some cleaners are designed exclusively for carpets. On the plus side, they are usually good at doing their job, and can be used on other stains which occur – not just pet stains. On the downside, they can’t be used on every single type of surface, so if your dog makes a mess somewhere else in the house, you will need to invest in a different type of product. Some types of stain and odor remover are exclusively designed to work in deep cleaning machines. If you have one of these, they could prove to be the ideal solution to your dog mess woes. But if you don’t, you are better off going with one of the other options listed above. Odors from your dog’s bodily secretions such as urine odor are unpleasant. As soon as they are excreted, the microorganisms contained immediately start to decompose. When they interact with the air, they release gaseous substances which are very unpleasant to the nose. There are various causes of pet odors and removing them from your home is bound to be one of your utmost priorities. Whenever you are using a pet odor remover, you should follow the instructions closely to ensure that you are getting the most out of it. But there are some other steps which can prove to be effective. First of all, a newspaper can actually soak up a lot more liquid like urine than a washcloth. Use it generously to remove as much as you can before using your pet urine remover. You can also try cleaning the stained area thoroughly with cold water. Once you have finished, you should then blot it up. Your final step should be spraying or steaming the area with the odor neutralizer. Create a plan of action that takes in the previous steps so that you can deal with the issue quickly and thoroughly whenever it occurs. The last thing that you want is for your carpet to be ruined forever. In extreme situations, you may need to call a professional carpet cleaner to take care of the problem for you. However, you don’t want to apply anything other than water before the cleaner as even natural products like vinegar can act as enzyme inhibitors. You could even consider covering the area with plastic to create the type of warm, damp environment which is conducive to bacteria. Make sure that you give the area plenty of time to dry as this is part of the process. If you have cleaned the stain, but the odor seems to keep lingering, you may need to repeat the entire cleaning process once again. Don’t get frustrated with the old messes as they can often be treated with multiple cycles. You could also try using some essential oils to replace the stink with something more pleasant. Start by adding 5 to 10 drops of essential oil to one cup of water in a spray bottle. Spray the mixture over the affected area to leave behind some more pleasant aromas. If you can prevent accidents from happening in the future, this obviously a worthwhile course of action to take. And if the problem continues to occur, you may need to give your dog a refresher course in their toilet training regime. There are plenty of commercial repellents which you can spray to put your dog off. Alternatively, you could try using common household liquids such as white vinegar, lemon juice, rubbing alcohol or ammonia. The smell of these are off-putting to canine creatures and reduces the risk that they will go to the bathroom there. Q: How does pet carpet cleaner work? A: Most pet stain removers contain bacteria and enzymes which consume organic material. As the matter is consumed, the stains and odors will begin to dissolve and dissipate. While every product is different, the best carpet stain removers simple require you to spray them on and leave them to dry to achieve the best results. Q: Can't I just use my regular household cleaner for my pet's accidents? A: There are a number of reasons why pet carpet cleaners are more effective than generic cleaners. Firstly, the bacteria and microorganisms delve down into smaller spaces than traditional chemicals, ensuring a more thorough clean. Many will continue working as long as there is organic matter which they can attack. If you are environmentally conscious, you can rest assured that many of these products are safer to use than traditional chemical cleaners. Finally, because ‘good’ and ‘bad’ bacteria are competing for the same food sources, non-parthenogenic bacteria will help to displace the disease-causing varieties. Q: Can I use these cleaners on my furniture? A: While some of these cleaning products can be used on your furniture, others cannot, so always check the label before applying them anywhere. The last thing that you want is to cause lasting damage to any of your treasured possessions. Our favorite product on the market is this professional strength stain and odor eliminator from Rocco & Roxie. It tackles all sorts of organic waste and deals with both the stain and the smell. The natural enzymatic bacteria contained within the product are activated on contact with organic matter, continuing to tackle the issue for as long as it remains. And even though it is tough and effective, it is also chlorine-free and color-safe. Since there are no hazardous propellants, there is also no residue left behind. As well as being certified safe to use on carpets, you can also use it on a whole host of other surfaces including floors, furniture, carriers, and all pet living and sleeping areas. Thousands of customers are satisfied with this product, and we agree with them, which is we have chosen it as the best stain remover available.